Joseph Mallozzi's Weblog: September 15, 2011: Akemi, SG-1 and Uh-oh! September 15, 2011: Akemi, SG-1 and Uh-oh! One of the great things about working on Stargate was the relative ease of the production. I’ve always likened the it to a well-oiled machine replete with checks and balances in place to ensure that any bumps experienced along the way would be minor and quickly addressed. Chalk it up to the hundreds of supremely talented and experienced individuals who did their jobs so well. Careful planning also helped in the form of early preparation in the lead-up to each season. We would usually wrap in October and then, while most of the production headed off for hiatus, we – the writers/producers – would spend a month dealing with post-production and planning the next season. In the case of the SG-1’s tenth season, we ended up breaking/outlining about eight stories before going our separate ways in December for a much-deserved break (which always involved writing). I remember sitting down to start work on my first script – what would be Morpheus – and finishing a first draft in less than a week. No procrastination, no first act second-guessing, no third act delays – I wrote, straight through, from FADE IN to FADE OUT. A first! I was amazed – and so emboldened, I jumped on my next script right away. Counterstrike also went exceedingly well. So exceedingly well, in fact, that I decided “What the hell” and jumped on the third script, Memento Mori. I ended up writing all three solid drafts in two weeks, gave my writing partner the hiatus off, and gave the production a great head start on the show’s tenth season. The original idea for this story was actually ship-based. I pitched out an episode in which the Odyssey, on its way back to Earth following an off-world op, encounters a seemingly derelict ship floating in space. 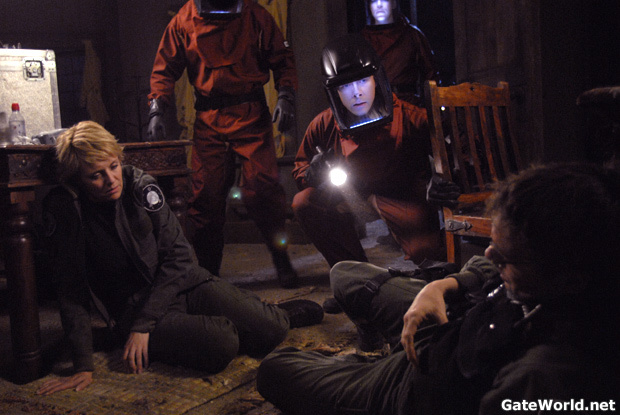 SG-1 and some members of the Odyssey team investigate and discover the crew long-dead. As they search through the mystery ship’s database, they fall victim to the “sleeping sickness”. One by one, they drift off until, eventually, only SG-1 remains to put together the pieces before it’s too late. The location was changed to a planet and we ended up using our standing village set in the VFX stage (the sight of such memorable sequences as the interior hive ships, the Atlantis cafeteria balcony, and the big Sheppard/Zelenka space jump in SGA’s Adrift), shot to creepy effect by the fabulous Andy Mikita. I loved a lot about this episode: Teal’c saving the day, Daniel and Sam slowly succumbing late in the episode, the slow-mo funeral-like montage and, of course, the B-story which focuses on Vala’s attempts to cheat her way through a psych evaluation. Claudia Black and Ben Ratner (who, coincidentally, I had drinks with the other night as he’s in town promoting his new movie, Sisters and Brothers) were a joy to watch. Their comic timing was impeccable – quick, restrained, and hilarious. Hmmm. Finishing up this blog entry on Akemi’s laptop. I took a break from working on today’s entry to upload some pics. For some reason, I couldn’t transfer photos from my camera so I decided to restart my Mac. It came back to life with the beautiful Japanese background. And nothing else. No desktop icons, no docks, nothing. It won’t even turn off and, unlike a PC, I can’t just pull the battery. I have no choice but to leave it on and drain the battery in the hopes that the next restart will restore everything. Clearly, you Mac users have this problem all the time. Nothing to worry about, right? Previous Article September 14, 2011: Let’s Celebrate! Next Article September 16, 2011: Tara Yelland wants to hear from you! Road Trip!!! Poor Mr Mallozzi, do you ever feel some of us don’t care what you want as long as WE get to keep Akemi? Needless to say her staying longer makes me happy too. If you won’t marry her, how about giving her a job as your official inspiration that no one else can fill and get her a permanent visa? Just saying. If you can’t control/alt/delete to get to commands to turn off, I can’t help you. I looked and found someone who said “remove the battery” but really, can you? Hmmm, since I have not loaded any pictures on my mac, not sure how to fix the prob,, I usually leave mine on and just close the cover… sorry, I know no help..
anything plugged into it blocking it,? maybe it will come back on in the middle of the night playing the canadian national anthem or the japanese one or the theme from stargate. I know,,no help.. sleep well. If you push and hold the power button for 5 seconds it should shut off. Erm… Hold down the power button until it shuts off? Have a safe and fun trip to Montreal!! Congrats on the extension Akemi, if the government didn’t do it I’d be more worried about the state of our government as a whole. And this is why although I have 2 iPods and an iPhone, I do not use a Mac!! Vala trying to cheat her way through the psych evaluation has always been one of my favorites and is absolutely hilarous. Great writing! I loved General Landry in that, as well. Watching Claudia right now on “The Peacekeeper Wars” (it’s been a while), and I must say, she’s good at what she does! I really need some new Stargate, Joe. Have a good night! Joey, after all you’ve been through the past year, I’m actually heartened to hear you’re back to having technical problems again. Maybe this is a good sign. Try holding down the power button. If it doesn’t shut down, try holding down the power button and the period button together. Question about writing. I know you hash stuff out before hand… But do you ever run into a situation where you are writing an episode or two or three, and someone else is writing an episode to follow yours, and you take your episode(s) (unknowingly) in a direction that clashes with the episode to follow or vise versa? How do you usually resolve it… other than talking it out with the better idea prevailing? Just curious. Thanks! BTW, something like that happened to my 8 year old mac. I took it in and they said, oh time for new one. So I bought one. Only to turn it back on to try to get pictures and docs off of it… and it works perfectly again. Now I have two. And I love them both!!!! Hm, I don’t think I have ever pulled the battery on my laptop, I don’t think that would be very good to the computer. If it’s really stuck, does holding the power button in for 5-10 seconds work? I know my PC has started up with no icons, nothing before (usually after a dreaded update) and it’s always come good when restarting it.I don’t know if that is any consolation though. i hope the computer things isn’t serious. You can’t pull the battery out of a Mac? [PC user] Seriously? oooow…saw THAT Episode! I hope that link works, it’s from google’s search results and not from the actual web page as I’m on my iPod touch right now and can’t cut and paste a URL since it just opens up the YouTube app to view it. Hey Joe, I’ve got a great question for you that I think many of us might want to know. As a self-proclaimed “foodie”(and the photographic evidence to back it up) do you have a favorite fast food restaurant and or item that you just can’t resist when you see it or think about it? I’ve given up a lot of fast food over the last ten years, including never darkening the doors of many franchises ever again. It makes resisting those temptations much easier! I cook for myself a lot now. It is so much more rewarding and better for you. That’s why I’m really enjoying your tales of home cooking and am curious what you’re going to learn in your cooking class back in Vancouver. I know it’s a bit after the fact, but you’ll never escape Stargate questions!! 1) Initially, the implication was that as the Ancients started dying out, they used the Dakara device to kick-start a new evolution of humans on Earth, and it was the Goa’uld’s subsequent discovery of the humans that spread them throughout the Milky Way. Conversely, in the Pegasus Galaxy, the Ancients seeded human life in several places, allowing them use of the Stargates. Gateworld’s incredible Stargate timeline has inferred that when the Ancients arrived in the Milky Way, they seeded human life throughout just like they did in Pegasus, but I did not think this was the case. Given the revelation that the Ancients spread human life throughout Pegasus, would that imply that it wasn’t just the Goa’uld who spread human life in the Milky Way, but the Ancients as well? To me, that wouldn’t add up. If that’s the case, wouldn’t Ra have found humans much earlier when their empire was first thriving through their use of the Unas? 2) When Atlantis fled to the Pegasus Galaxy, was that what was left of the Ancients? Or is Atlantis simply one group out of many who decided to flee to Pegasus? Did several city ships go several different places? Did the majority of the Ancients die out or stay behind, and Atlantis is just one group of Ancients who decided to flee? Or was Atlantis the embodiment of the Ancient civilization at that time? I’m mainly just wondering if the Lanteans are in essence representing latest phase of the Ancients as a whole, or if they are but a small fragment who managed to get away? I don’t see why you can’t pull the battery. I”ve been able to on all of my mac laptops. Just turn it over, turn the little “screw” with a coin, and then jimmy it out a little on the side, or turn it back upright and tap the laptop a bit. Or hold the power button in until the laptop shuts off. I loved the Vala scenes in Morpheus–very funny and also gave us insight into the character. You had me going with the immigration stuff. I’m glad you doubled checked! Even though Hubby is a Microsoft employee, I’m still sorry about your computer. I asked hubby, he said he understands why you would resort to draining the battery but it can’t be good for future battery life. Mac is supposed to have great customer service. Did you try calling them? I’ve got a full day of baking desserts for son’s school. On the menu: fried peach pies (always a hit in the South), Italian cream cake, and M & M cookies. It will be a fun and great smelling day! Akemi is pure gold. Custom Bento boxes, artisticly meaningful greeting cards, supreme culinary cooking skills, entertaining English lanuguage usage, classic beauty, and the most important thing, a spare laptop so we don’t go without a daily blog post. Gold! Mac. How quaint. No but seriously. If it doesn’t go back to normal with the next restart you’ll have to take it to a “genius bar” and the spotty kid behind the counter will say ‘No problem, we’ll have a look at it. Come back in a couple of hours’. Which you will and when you do he’ll say ‘Yeah, it’s the logic board (when in doubt, it’s the logic board) You’ll have to come back for it in a couple of days’. Which you will. Free of charge if the guarantee is still on. No problem. But trust me. At this point you’ve already seen the best days of your mac. It’ll never be the same again. And the new logic board will not have an extended guarantee. You’ll be stuck, waiting until it dies so you can go get a proper PC. The perfection and ease of use of a Mac disappears when things start going pear shaped. They are beautiful. I agree. Buy one. But then put it in a frame and hang it on a wall.